Orphan Technologies: A phoenix rises? SOME technologies look wonderful on paper but don’t quite make it in the big, bad world. Airships. Autogyros. Hovercraft. They all work. They even have niche applications. But they have never lived up to their promise and been widely adopted. So it is with ground-effect vehicles—aircraft-like machines which skim a few metres above the sea by acquiring part of their lift from aerodynamic interaction with the surface beneath. This means they use less fuel than a true aircraft while travelling faster than a ship. Many attempts have been made to build them. Boeing tried in the 1990s, with the Pelican Ultra Large Transport Aircraft. The Soviet Union tried with the Ekranoplan, whose prototypes now moulder in the naval base at Kaspiysk. Two German engineers even attempted to construct what was, in essence, a ground-effect aquatic sports car. All failed—or, rather, failed to make something that was better than established alternatives. But hope springs eternal, and the Wing Ship Technology Corporation, a South Korean company, is trying to revive the idea. The country’s armed forces have already agreed to buy some and the firm says it hopes to announce its first commercial sales (to an oil-and-gas firm and a Mediterranean ferry company) shortly. 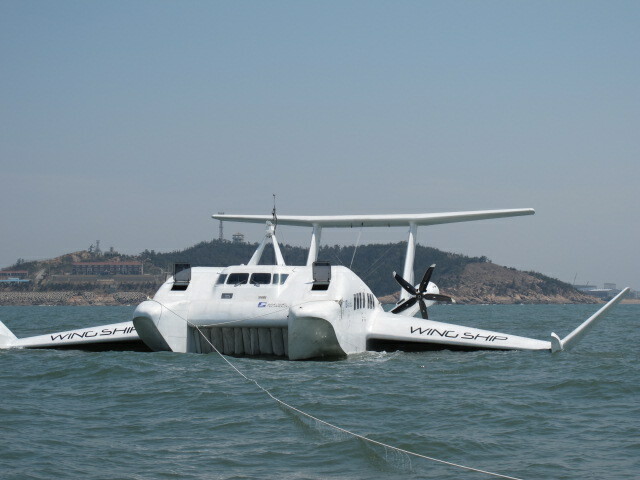 The prototype (pictured) is powered by a turboprop and can carry 50 passengers. It has a catamaran-style hull and a reverse delta wing. Its cruising speed, 180kph (110mph), makes it faster than a jetfoil, its principal rival. And the production version will have a range of 1,000km. The crucial breakthrough, the firm believes, is the delta wing. This approach was actually devised in the 1960s by Alexander Lippisch and Hanno Fischer, the makers of the putative “sports car”. Their single-seater Aerofoilboot, as they dubbed it, was not a commercial runner, but Wing Ship Technology believes the idea of a delta wing is sound and, though Lippisch is now dead, Mr Fischer is one of their advisers. The delta wing’s geometry amplifies the ground effect, allowing the new craft to cruise as high as five metres above the water’s surface. That means it is less likely to be confined to harbour by rough seas, which was one of the problems encountered by previous designs. It also launches itself by directing some of the airflow from the turbo props downwards, to create a temporary hovercraftlike effect until it is travelling forwards at full tilt. The difficulty of getting airborne was another bugbear of previous designs. It remains to be seen whether Wing Ship Technology’s craft actually will be the breakthrough that enthusiasts of ground-effect vehicles are hoping for. But if it is, it will be an example of the value of persistence. There may yet be hope for the hovercraft, the autogyro and the airship. Previous Medical robotics: Would you trust a robot with a scalpel?